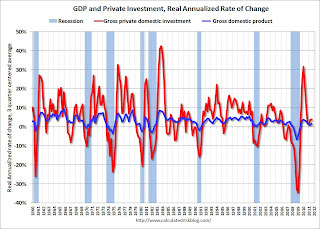 The first graph shows the real annualized change in GDP and private investment since 1960 (this is a 3 quarter centered average to smooth the graph). GDP has fairly small annualized changes compared to the huge swings in investment, especially during and just following a recession. This is why investment is one of the keys to the business cycle. The second graph shows the contribution to GDP from the four categories of private investment: residential investment, equipment and software, nonresidential structures, and "Change in private inventories". Note: this is a 3 quarter centered average of the contribution to GDP. 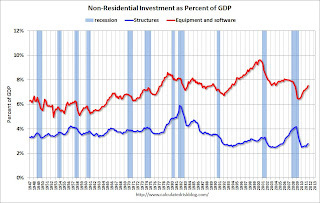 This is important to follow because residential investment tends to lead the economy, equipment and software is generally coincident, and nonresidential structure investment lags the business cycle. Red is residential, green is equipment and software, and blue is investment in non-residential structures. The usual pattern - both into and out of recessions is - red, green, and blue. The dashed purple line is the "Change in private inventories". This category has significant ups and downs, but is always negative during a recession, and provides a boost to GDP just after a recession. Change in private inventories has made a large negative contribution to GDP over the last four quarters, and will probably make a positive contribution in Q4. The key leading sector - residential investment - has lagged this recovery because of the huge overhang of existing inventory. Usually residential investment is a strong contributor to GDP growth and employment in the early stages of a recovery, but not this time - and that weakness is a key reason why the recovery has been sluggish so far. Equipment and software investment has made a significant positive contribution to GDP for nine straight quarters (it is coincident). The contribution from nonresidential investment in structures was positive in Q3. Nonresidential investment in structures typically lags the recovery; however investment in energy and power is masking weakness in office, mall and hotel investment. And residential investment has finally turned slightly positive and will make a positive contribution to GDP in 2011 for the first time since 2005. What does this mean for the business cycle? Usually residential investment would turn down before a recession, and that isn't happening right now. Instead residential investment is mostly moving sideways. 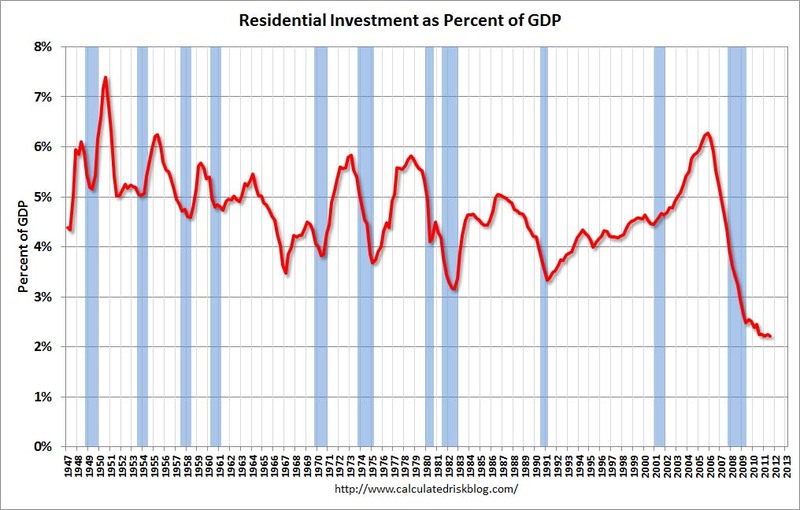 The third graph shows residential investment as a percent of GDP. Residential investment as a percent of GDP is at a record low, and it seems unlikely that residential investment will decline significantly lower as a percent of GDP - especially with a pickup in multifamily investment and some increase in home improvement (Note: Residential investment is mostly investment in new single family and multifamily structures, home improvement and brokers' commissions). 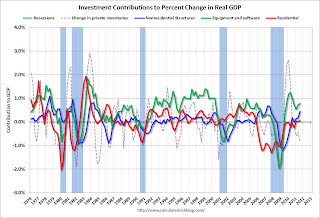 It seems likely that residential investment will make a positive contribution to GDP in 2012. 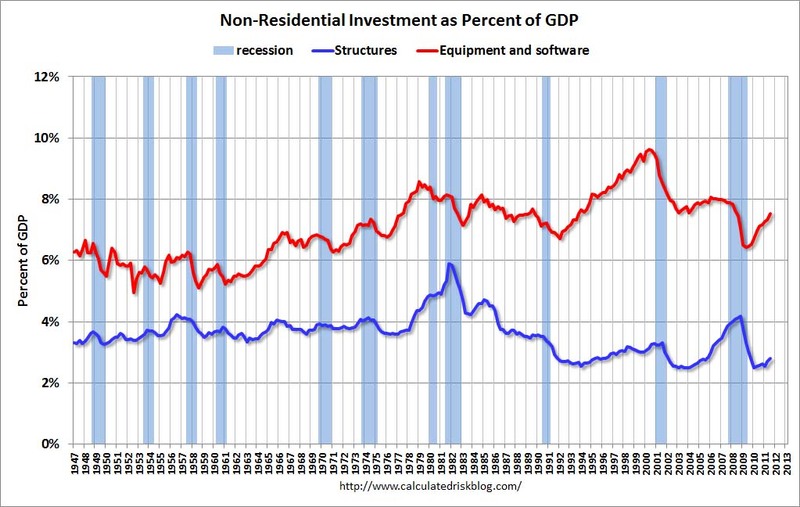 The last graph shows non-residential investment in structures and equipment and software. Equipment and software investment has increased sharply, but is still at a fairly normal level of GDP. And non-residential investment in structures increased in Q3, but this is still very low. A key fear is that the financial crisis in Europe could drag the US economy into another recession. That is possible, especially combined with ongoing household deleveraging and fiscal tightening in the US (with current policy, Federal, state and local governments will all subtract from GDP growth in 2012). However it seems unlikely there will be a sharp decline in private investment. 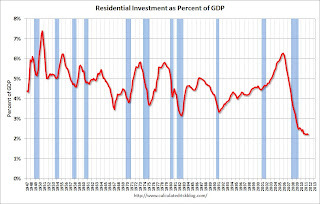 Residential investment is already at record lows as a percent of GDP and will probably increase in 2012. Changes in private inventories will probably rebound a little, and investment in non-residential structures is also near record lows. It is possible that investment in equipment and software could decline in 2012, but it doesn't seem likely there will be a sharp decline in overall private investment. If the euro zone comes apart rapidly - or there is further non-private tightening - a new recession is possible in the US, but without a sharp decline in private investment, it is unlikely a US recession would be severe. 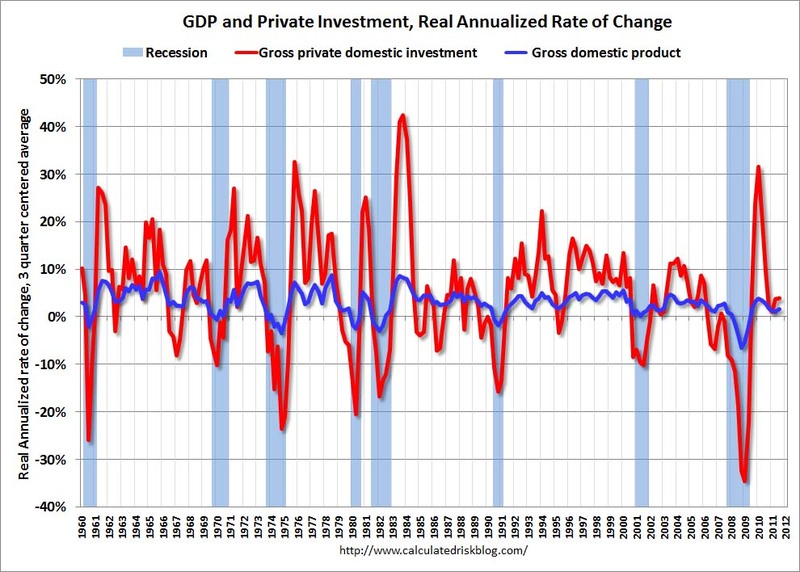 Right now it appears overall US private investment will increase in 2012, and that the US will avoid a new recession.